The Sioux Trails Chapter of the American Guild of Organists (STAGO) is pleased to present a free workshop on the ancient and foundational practice of plainchant. 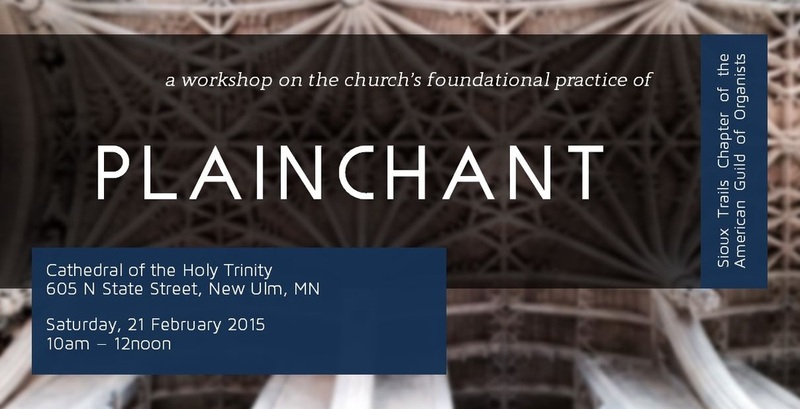 This workshop aims to introduce plainchant to clergy and church musicians new to the practice, and to refresh the practice for those with more experience. Nathan and Lisa Knutson from the Cathedral of the Holy Trinity in New Ulm are local experts on plainchant and have practiced and taught chanting in various congregations. Their combined knowledge and insight are an invaluable resource to our community that will benefit all who attend. Clergy, church musicians, and laity from all traditions are welcome to attend this exciting opportunity to engage the practices of plainchant. We look forward to seeing many of you there!